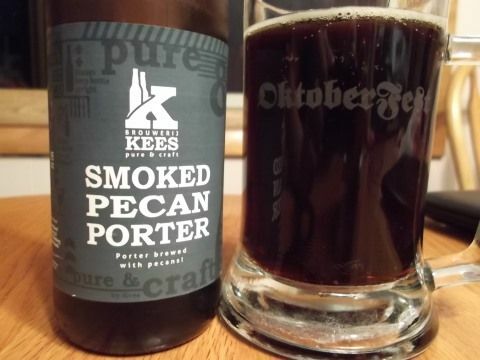 The folks at Brouwerij Kees in The Netherlands seem to be taking a page from the Schell playbook in that I can find no mention of their Smoked Pecan Porter on their website just as I found no trace of Schell's highly palatable Prost Pack on their site. To the best of my knowledge Smoked Pecan Porter was released this fall so it's not like a deep dive into the archives is required. This is my first Brouwerij Kees brew. Looking over their website it appears to be a very Americanized brewery with various varieties of eyepahs, plenty of Simcoe and Cascade hops, and the obligatory barrel aged beers. I dread to think what it must cost to have whiskey barrels sent over from England or the States. Or the hops, for that matter. No Simcoe wet hopping for them. Unless they've begun growing American hops over there. And now that I think about it, pecans are an American ingredient too. Now you don't see pecans very often on a beer label. Indeed, this is only the second time that I've had such a brew, the first being Lazy Magnolia's palate pleasing Southern Pecan Nut Brown Ale. While nuts seem like the perfect complement to malt, I suppose it is their price that keeps them from being utilized in brewing as often as I'd like. Smoked Pecan Porter was a very deep copper color although a casual glance at my glass only revealed silky blackness. I don't know if it was poor wrist action on my part or who but I managed to pour the beer with no head. Sure, there was a smattering of tan bubbles but not really a head. No luscious tan foamy goodness. The beer was clear, however, and I caught a fair number of bubbles inside the reddish brown confines. The beer's aroma took my by surprise. OK, not the roasted grain part but the stone fruit sweetness and the whiskey smell. It's only 6% yet my nose swore that it inhaled something that was not totally unlike whiskey. And there were both that malty flavor as well as that sharp, pungent burn. Despite just having used words to indicate a big, bold smell, the whiskey as well as the sweetness were fairly mild. I just wasn't expecting them in a porter. Sadly for me, the smoky scent was something more hinted at than actually realized. Grainy flavors that ranged from lightly roasted to slightly more roasted stood out. For some reason I could discern no smoke. I wasn't expecting a whole lot judging by the aroma but I was rather anticipating some. There was a little nuttiness which went perfectly not only with the initial grainy tastes but also with the mild rye spiciness. Whiskey and fruity sweetness followed the roasty grains from the smell. The smoke finally made an appearance on the finish, albeit a brief one, where it was joined by a pleasant bit of herbal hoppiness and (finally!) dark grainy bitterness. Not a bad ending by any stretch. Lacing was decent with a couple generous streaks and a few foamy spots. The label here indicates that Simcoe and Cascade hops were used but I tasted neither tropical fruits nor pine. I'm not complaining but it's suspicious. Caramel malts must have been responsible for the sweetness I tasted. Honestly, though, I tasted more whiskey than I did dark grains which only came out at the end. And the smoke was so restrained that you'd think smoked malt was worth its weight in gold. I mean we're talking near homeopathic levels. On the other hand I really enjoyed the nutty taste and the rye too. But overall this beer just tasted old or somehow mistreated on its way over. It lacked not only the dark grainy presence I expect from a porter but also the vital spark of fresh beer. None of the flavors were sharp or sprightly; rather they tasted dull and worn. Regardless of this beer, I wholeheartedly endorse smoked rye porters made with pecans. Or any nut, for that matter. Junk food pairing: After pouring your Smoked Pecan Porter, cozy up to a bowl of BBQ potato chips or some Buffalo Blue Cheese Combos. At some point around the middle of last month I continued hot and cold relationship after seeing a new brew at my local bottle shop – Bavarian Dunkel. Most new Leinenkugel brews seem to be yet another iteration in their neverending parade of shandies. Yet here was a nod to the German roots of the venerable Chippewa Falls brewery. Reading the label, however, engendered hesitation as it noted that the bier was "Brewed With Natural Fruit Juices". Was this the first step towards the shandification of the dunkel? According to Chris Drosner, Bavarian Dunkel replaces Snowdrift Vanilla Porter. This was a positive development to my mind as I found that beer to be syrupy dreck. Still, fruit juice in a dunkel? It's not so much that I have a preternatural disposition against such a pairing as much as it is an anxiety over who it is introducing this novelty. This is Leinenkugel, after all, the brewery that has twisted and warped the poor shandy from being a simple, pleasant mix of ginger beer or lemonade and beer into the Boone's Farm of craft brewing. This experiment could be tasty or it could be Kool Aid. Regardless of Leine's shandymania, the brewery is certainly no slouch and can whip up a fine brew. And so it's no surprise that, on appearance, at least, Bavarian Dunkel is shining example of bier. At casual glance, it is a stygian cupful, with a deep, deep copper color. I couldn't discern clarity but I am confident that is was clear as the style demands unless the fruit juices muddied the waters. The head was tan and creamy, lasting 30 seconds or so. Since light could barely penetrate the darkness, I couldn't tell what the bubble situation was like inside. The aroma was full of dark chocolate and roasted grain like a good dark bier but the fruit juices – blackberry and elderberry as Mr. Drosner discovered – made themselves known. I thought of sour cherry. Mild grassy hops rounded things out. I am guessing there weren't a whole lot of bubbles to be seen as the carbonation was restrained. However, this allowed bitter chocolate to step to the fore with roasty grain and faint coffee trailing. There was a slight fruity sweetness which tasted malty in addition to a moderate berry-like fruitiness. Elderberries are very tart and so I'd say this tasted more of blackberries. The hops linger in the background adding only a touch of bitterness which melded with the chocolate and, I'd bet, some elderberry tartness. At the end the bier's choco-fruitiness was joined by some spicy hops which added a sprightly sheen of mint. There was no shortage of Schaumhaftvermoegen with thick streaks aplenty adorned with spots of foam all around. With the first sip Bavarian Dark allayed my fears of it being an unearthly dunkel-shandy hybrid. It has a medium body with a nice creamy texture full of rich dark chocolate. The fruit juices are subtle and complement the dark grain flavors very well. Nothing overly sweet or cloying here. I wish more Wisconsin breweries steeped in the lager tradition would do something like this instead of abandoning it for pastures of tropical fruit eyepahs. 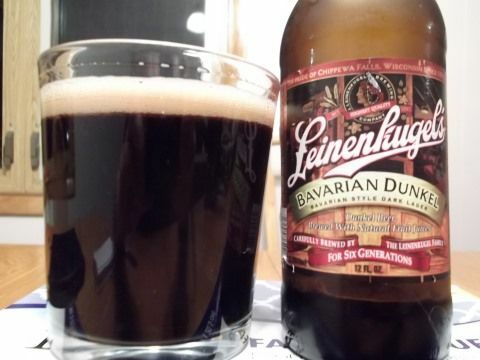 Junk food pairing: Being the new winter seasonal, Bavarian Dunkel will be around for a spell. Well, at least until next month when summer seasonals come out. You'll have some time, at least, to enjoy one with a bag of Jay's Barbeque potato chips. The BBQ dust has a smoky side that goes well with the dunkel side of Bavarian Dunkel but also a dash of sweetness to complement the berry juice. On the sweet side gingerbread cookies are everywhere these days and also pair well with it as they have a nice pungent earthiness to them that I like with the roasted grain flavors in the bier. My last two reviews were from biers released in the spring and summer, respectively, so it's only proper that I now take on a more youthful brew from the autumn. Indeed, with the winter still a week and a half away, astronomically speaking, one could argue that this bier is yet in season. Available exclusively in Schell's fall sampler – its Prost Pack – I believe it arrived just as the autumn began. It's not easy finding these sampler packs from our neighbors to the west. Schell doesn't exactly toot its own horn over them either. I can find neither hide nor hair about the Prost Pack at the brewery's website. This is perhaps understandable regarding their normal sampler pack which is simply a mix of year-round and seasonal biers. But the Prost Pack contains two biers not found elsewhere so why is Schell mum when it should be out there proudly attacking the hoppy tyranny of the eyepah? Here in Madison I've had luck at Riley's Wines of the World but have been told that there's a lag time of of up to two months before a new Schell's product hits their shelves. Two months?! Then again, it's probably fair to say that Madison is not exactly in love with Schell and their German craft ethos as the rough beast I call home slouches towards Portlandia to be reborn as a pale reimagining of its lagery roots. One of the new biers in the Prost Pack is Chimney Sweep with Cocoa Nibs. 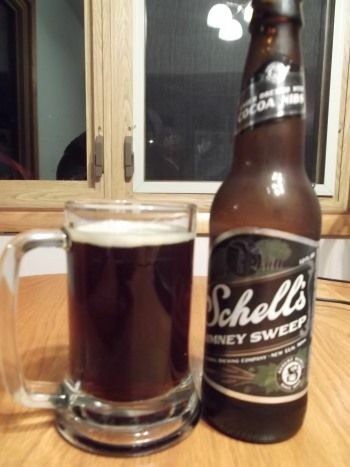 Chimney Sweep is what Schell calls an "extended seasonal" which means it's on store shelves a goodly part of the year. It is a rauch dunkel and a rather tasty one at that. Cocoa nibs are, I read here, bits of cocoa beans that have been fermented and then roasted in preparation to be transmogrified into chocolate. The admixture of roasty, earthy pyrazines and thizoles from the cocoa nibs and the smoky guaiacols and syringols sounded like a match made in heaven to me. In the glass, the bier appeared ebony but held to the light I could see that it was a deep ruby-copper confluence. It was clear and I spied with my little eye a fair number of bubbles inside while up top was a small, creamy tan head that hung around about half a minute or thereabouts. The aroma was heavenly with bitter chocolate and the base bier's rich smoke doing a delicate pas de deux. There was a lingering sweetness here too which is part and parcel of the non-cocoa nibbed Chimney Sweep. Firm carbonation hit my tongue and was followed by the smoky goodness that I know and love. Dark chocolate was tucked in behind which not only added a nice earthy taste but it also added a touch of bitterness. The dunkel shone through with a nice, hearty roasted grain flavor with just a smidgen of coffee as well. As the bier warmed it took on the taste of stone fruit but never became overly sweet. For the finale the smoke lingered while a grassy hoppiness stepped out from the shadows to add a little bitterness and some dryness too for a nice, crisp finish. There was a fair amount of Schaumhaftvermoegen which came in the form a webbing around much of my glass. Opening this bottle I felt that it must surely be preordained that I'd love this bier and so it was. Those cocoa nibs didn't turn my beloved Chimney Sweep into some strange chocolate milkshake-like concoction. Instead they settled easily into a milieu of complementary flavors. The cocoa sat comfortably next to the smoke, roasted grain, and coffee of the rauch dunkel. Malt sweetness added a nice contrast. And I really enjoyed the hops on the finish which, on the one hand, added a contrasting dose of greenery yet also provided bitterness to join that of the cocoa nibs. While Chimney Sweep with Cocoa Nibs has a medium body with plenty of room for its variety of flavors, it also has that nice clean lager taste. It is a shame that such a tasty brew was sequestered away in a variety pack that was given precious little press. Junk food pairing: Grab a bag of Pepperoni Pizza Cracker Combos to go with your Chimney Sweep with Cocoa Nibs. The faux pepperoni adds a spicy pork-like flavor and we all know you've gotta have pork to go with German biers. While my previous review was of a bier getting a little long in the tooth, this one is of a brew that is definitely, well, younger. Cherry Hallo Ich Bin Berliner Weisse was released sometime this past summer though, if memory serves, I didn't find a 500ml can of it around Madison until the autumn. It was brewed by Mikkeller, a Danish gypsy brewer. I think the can indicated where the bier was actually brewed but it's long gone and I didn't note it down. Mikkeller reminds me of Wisconsin's own MobCraft in that store shelves are always filled with a myriad of their brews but the selection is constantly changing. Don't like what you see at your local bottle shop? Just come back next week and you'll be confronted with a whole new collection of their brews. Does Mikkeller even have an annual beer? My exposure to their libations is quite limited. I suppose this is a combination of most of their beers just not appealing to me and price. I saw a $25 bottle yesterday which is out of my price range except under certain circumstances. But the stuff does have to travel across the ocean and is presumably not brewed in mass quantities so it can't be cheap. It seems odd to be writing about a Berliner Weisse as snow falls outside my window. I am quite behind in my reviews. 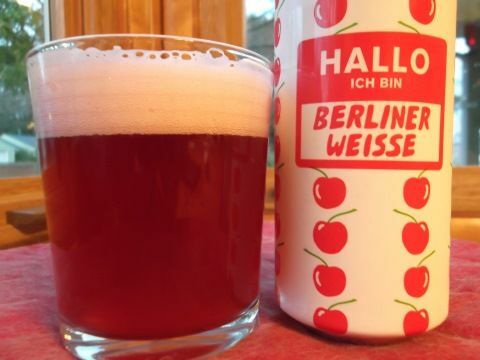 Hallo Ich Bin Berliner Weisse poured a gorgeous red hue with a purple tint. It was, as expected, rather cloudy. I managed to top my glass with a large, firm pink head that stuck around for quite a while. Also present was the customary surge of bubbles inside. Champagne of the North indeed. This was one pretty brew. The lactobacillus gave a wonderful lemony scent which was accented by that of the cherries. Tucked in the aroma was also some grain/wheat. On the first sip my tongue was treated to a healthy dose of fizz to start things off. This was followed by a large tart blast that was only mildly citrusy/lemony. The cherries brought up the rear and, as with the aroma, had to be content with aiding and abetting the sourness. Unlike a lot of Berliner Weisses I've had, I could taste the wheat. Not strong, mind you, but easily discernible amongst the other flavors. The finish was really nice as some tartness and the cherry lingered until the next sip. There was no lack of Schaumhaftvermoegen as my glass was lined with foamy streaks and spots aplenty. It looked good going out just like it did coming in. This was a very fine bier. The tartness was firm but not deadly although the carbonation was plentiful enough to boost the acidity towards Destihl levels but it never got that intense. The cherry added a tasty, if subtle, layer of flavor that contrasted nicely with the sour. It was light, fizzy, and refreshing and writing those words makes think of warmer days as yet more snow falls. Junk food pairing: I prefer lighter accompaniment with my Berliner Weisse. Try a bowlful of Bugles. However, I can also see trying to capitalize on the cherry here and so it would not be out of place to have a Hallo Ich Bin Berliner Weisse in one hand and a Hostess Cherry Pie in the other.